The magician shows a spectator a small transparent card. He asks the spectator to select a playing card from a well shuffled deck and then to lend him his cell phone. Next The magician hands the transparent card over to the spectator inviting him to hold it up in front of him. The spectator is now invited to concentrate on his card while the magician takes a photo with the spectator’s cell phone. 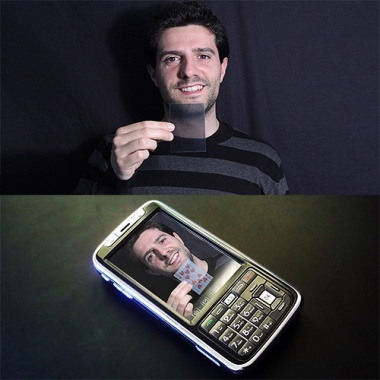 Once the photo is shot, the spectator will see in the photo ON HIS OWN cell phone that his selected card magically appeared on of the transparent card he was holding! Easy to do! The deck of cards is not included. You can repeat the effect with a different card.